Damalie, 21, is passionate about her dream of working in marketing. Today, she is studying for a Bachelor’s in Social Science with a double major in psychology and marketing at Monash University, South Africa. Having grown up in SOS Children’s Villages Uganda, she names her SOS mother as her idol. Damalie joined SOS Children’s Villages at the age of six. “It was and will always be the best experience for any child as they grow up. Just like any other child, I experienced my mother’s love and care,” she reflects on life in an SOS family. “It was a whole new exciting and joyful experience compared to the life before SOS. The feeling of being isolated simply because of your background is completely replaced with togetherness, love and care from the SOS family as a whole,” she adds. Her memories from the village are filled with warmth. “My favorite childhood memories were always during the festive season. I remember mother would prepare good sumptuous meals for us to feast on. It was such a family day of laughter together with our older brothers and sisters,” she says. 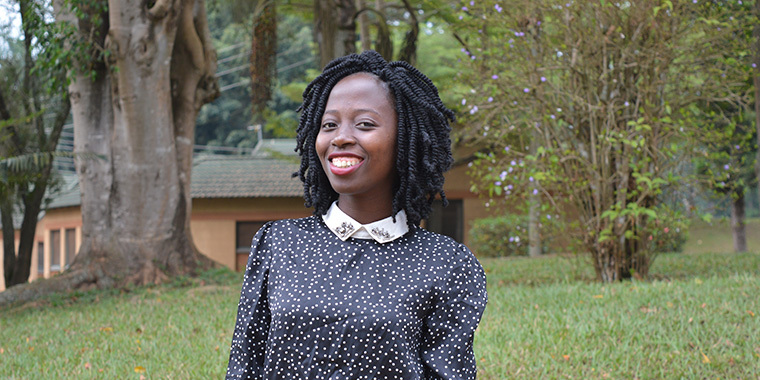 Through her youth leader, Comfort Asiimwe, Damalie found out about the GoTeach program, a partnership with Deutsche Post DHL that aims to increase young people’s skills and employability. It also taught basic entrepreneur skills, so young people can construct their own jobs and future. “I was privileged to learn about life in the working world. Here, I learnt about how to prepare for interviews, how to write job application letters, how to be an efficient employee and more importantly how to focus on being more of a job creator than a job seeker,” says Damalie. Learn more about YouthCan! here.